For the adventurous with no fear of heights visiting Switzerland – known for its towering peaks of the Alps, ski resorts and hiking trails – don’t miss this high thrill of your life! 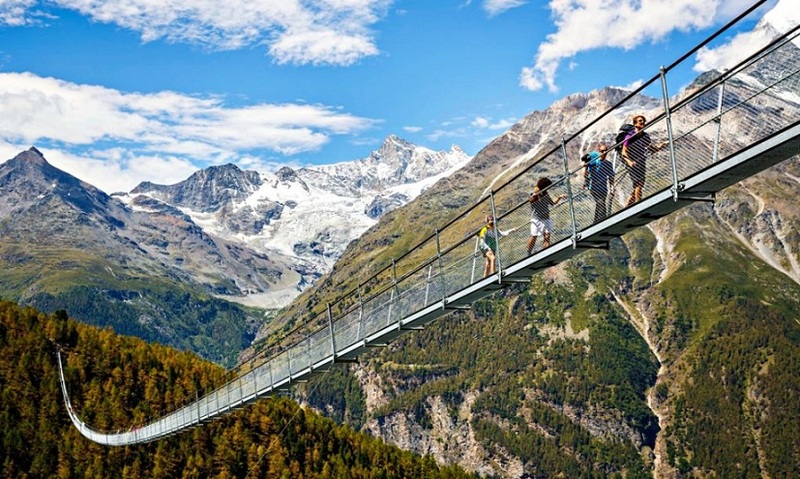 The world’s longest pedestrian suspension bridge over the Swiss Alps is now open, and while it offers a thrill for the senses, it is also likely to remind the world about the true meaning of acrophobia. According to a news release by Swiss travel agency Zermatt Tourism, “the thrill of traversing the precipice is indescribable”. Besides a chance to experience one of the world’s most epic mountain landscapes from a unique perspective, the elevated trail offers captivating views of the 14,783ft Weisshorn Mountain and the Bernese Alps, making the crossing a worthwhile event. Erected in only 10 weeks by Swissrope (Lauber Seilbahnen), an entity that has built “countless” suspension bridges in Switzerland and abroad. 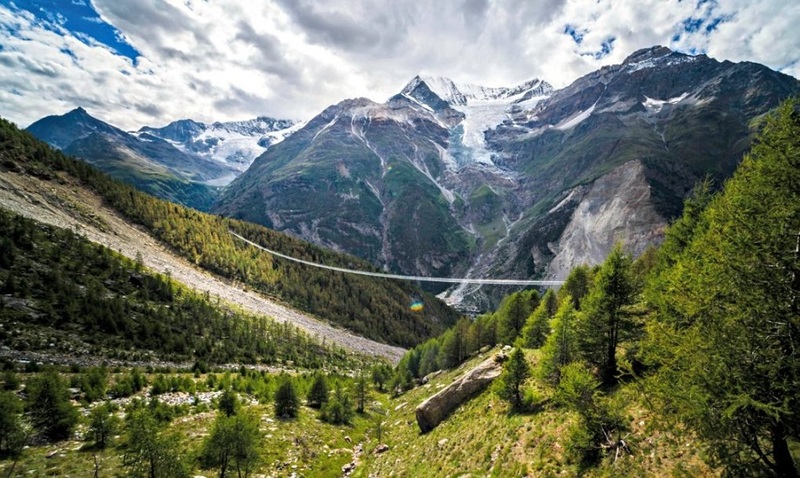 Behind this feat of human ingenuity is Swissrope (Lauber Seilbahnen), Frutigen, a specialist construction firm that amazingly erected the hikers’ suspension bridge near Randa in only 10 weeks. It has already built “countless” suspension bridges in Switzerland and abroad. The suspension bridge is 1,620ft long and 300ft above an Alpine ravine, according to Inhabitat, a website on green design and innovation. The Charles Kuonen Suspension Bridge forms part of the Europaweg, a two-day mountain trail which connects the towns of Grachen and Zermatt. This new bridge saves hikers a long detour after falling bricks damaged a previous one. Meanwhile, CNN reported that the bridge is comprised of steel and is 25 inches wide. As the footstep surface is grated, you can look below and view the Grabengufer ravine as you walk. The bridge’s grated footstep surface allows you to view the Grabengufer ravine below as you walk.